Samsung's yet-to-be-announced Galaxy Note 3 Neo, previously thought to be called Galaxy Note 3 Lite, might see the light of day soon, if a new leak is to be believed. Sammobile has posted some alleged press renders of the rumoured Galaxy Note 3 Neo, which showcase the device in its full glory. The site claims that the renders were sent by an unnamed person working with a Belgian retailer, and also claims that the device will go up for pre-order soon in the country. The leaked press renders of the alleged Galaxy Note 3 Neo show the device's front and rear panel, which are very reminiscent to the Galaxy Note 3 phablet. The new leaked renders seemingly confirm that the alleged Galaxy Note 3 Neo will sport a faux-leather rear cover. Rumoured specifications of the alleged Galaxy Note 3 Neo include a 5.5-inch HD Super AMOLED display, an 8-megapixel rear camera and will pack a 3100mAh battery. Previous leaked documents further claimed that the device would include a 2GB of RAM and 16GB inbuilt storage, similar to the Galaxy Note II. An earlier report suggested that the rumoured Galaxy Note 3 Neo would be powered by a 1.7GHz dual + 1.3GHz quad-core (Hexa) processor, which if true, will be a definite upgrade to the Exynos processor equipped on the Galaxy Note II. 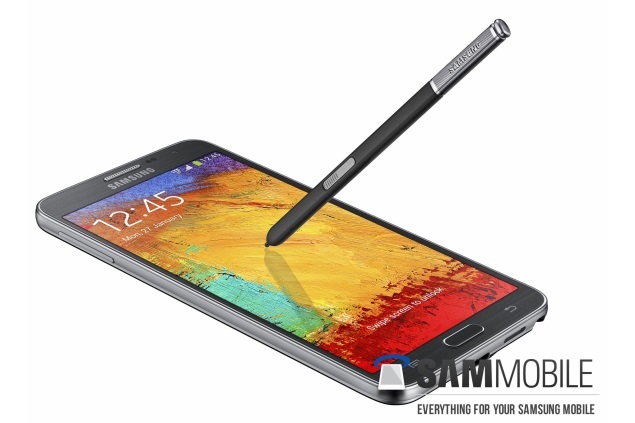 Earlier this month, the alleged Galaxy Note 3 Neo was leaked alongside the Galaxy Note 3 phablet.